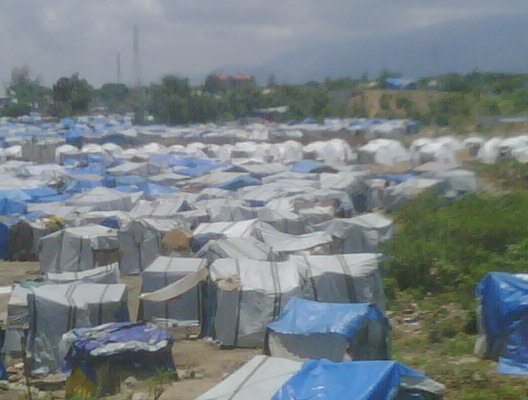 May 13, 2010 Port au Prince. Today UN spokesperson Edwin Mueller said the UN was opposed to President Rene Preval' decision to seek an extra 3 month emergency term now, delaying the elections scheduled for the end of Nov. 2010. He said the GOH could easily wait til November to determine if emergency conditions existed that required such a delay, and that elections have been held in other countries under much more turbulent conditions. He also said the UN is witholding further aid to the GOH, and will channel it only to NGOs, pending improvement in the GOH's administration of the emergency shelter camps, where at least 1.41 million people -- probably more -- are now living under miserable conditions. Separately, opposition groups have today announced plans for protests next Monday May 17, demanding Preval's resignation. Stay tuned!! !